Honorees from left: COE student Serena Moore, Dr. DeeDee Bennett, Chelle McIntyre-Brewer, and COE staff member Amelia Tangeman. They're leaders on campus, in their fields, and in the community. 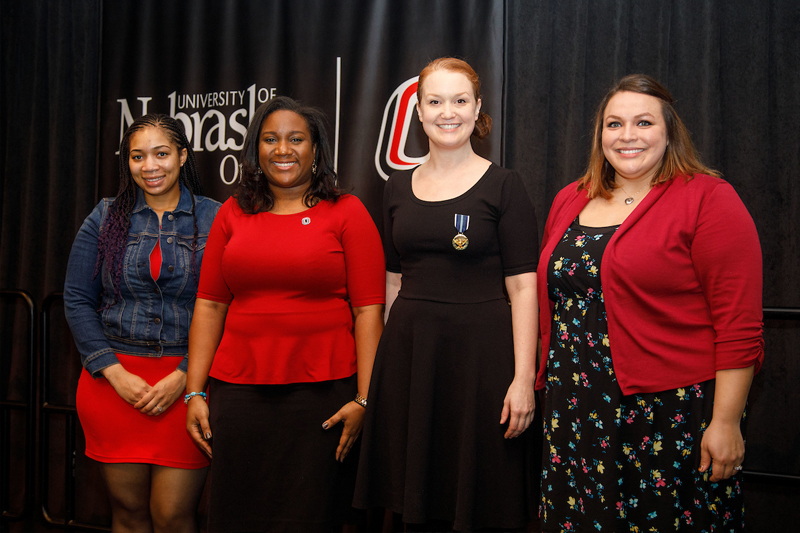 The Chancellor's Commission on the Status of Women (CCSW) celebrated the contributions of Maverick women on Tuesday, Feb. 27 during the CCSW annual luncheon. 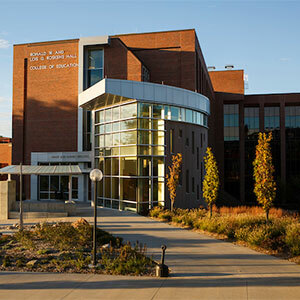 Two College of Education (COE) leaders were recognized for their accomplishments at the event. COE was also represented this year through a new partnership between CCSW and WiSTEM Pro^2, a COE-led STEM-based professional organization working to advance the full and successful participation and inclusion of women within academic professions by addressing gender equity, recruitment and retention, awards and recognition, and career advancement and satisfaction. Serena brought her daughter Layla with her to accept the award from Chancellor Gold. The 2018 Student Scholarship Award was presented to public health major Serena Moore. Serena is the co-founder of new student organization Caring Resources and Nurturing Environment (CRANE)--a support group to help single parents at UNO remain in school during and after pregnancy. 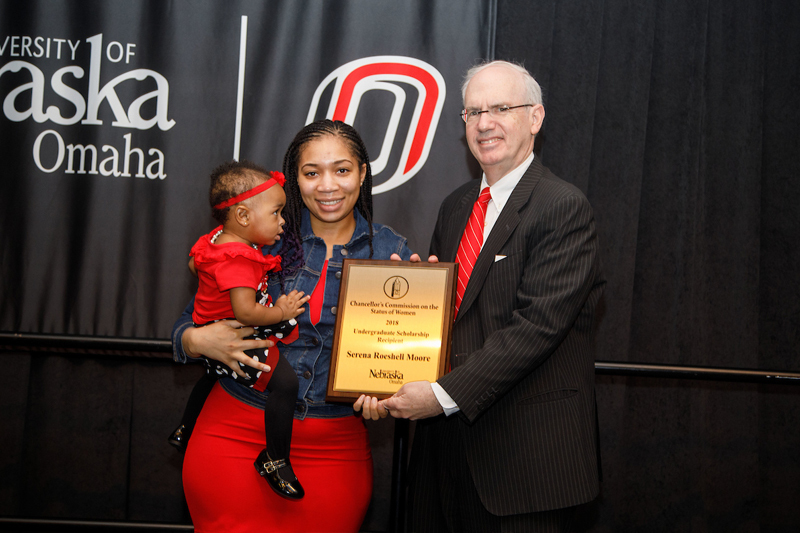 Serena was inspired to begin the support group after becoming pregnant with her daughter, Layla, during her sophomore year at UNO. Determined to remain a full-time student, she gave birth to her daughter in Oct. 2016, and finished Fall semester as a full-time student with a 3.835 GPA. According to Serena, this was the first year she believed in herself as a student. 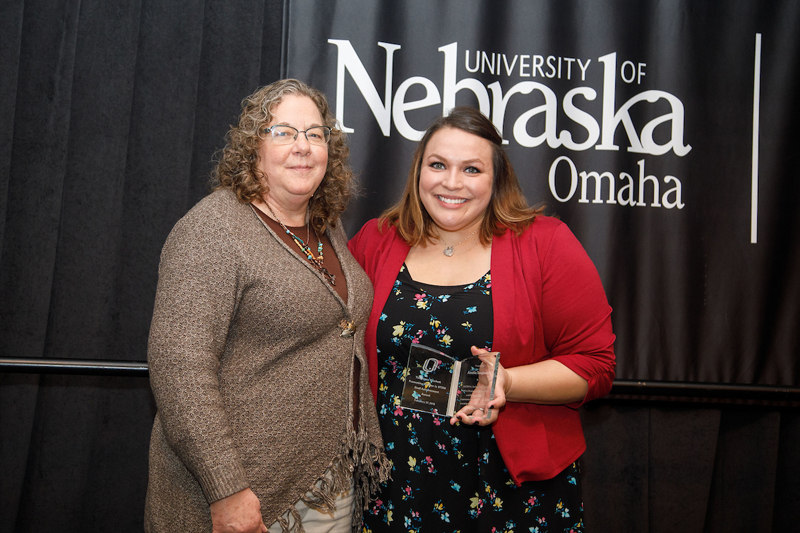 Reaching her goal also ignited her passion to help other pregnant and parenting mothers remain in school at UNO. As a mother, Serena said she knows the challenges of being a parent and student, and hopes to connect other Mavericks with the same kind of support that helped her believe in herself and thrive academically. From left: ITS’ Joyce Crockett with Amelia Tangeman. Amelia Tangeman, Community Outreach Coordinator for COE’s Office of STEM Education, was presented with her award by Joyce Crockett and WiSTEM Pro^2 President and COE faculty member Dr. Kelly Gomez-Johnson. Amelia was recognized for her unwavering dedication to promoting STEM career pathways for youth through her outreach activities. Amelia called it a true honor. "Too many girls are told that they cannot be a scientist, engineer, mathematician, computer programmer, etc., and through programs like UNO Eureka!-STEM, of which I am the Project Director, we are working to change that dialogue to one that empowers girls to pursue STEM majors and careers." Amelia’s work is an integral part of STEM outreach at UNO. She helps to coordinate events such as Lights On After School, the Nebraska Robotics Expo, the NOYCE Scholars Outreach Program, and Nebraska SCIFEST. Since 2013, Amelia has coordinated the Eureka! STEM summer camp program at UNO for underrepresented girls served by Girls Inc. She is a member of the UNO STEM Leadership Team and adjunct STEM instructor in the Teacher Education Department as well as serving on the WiSTEM Pro^2 Executive Board as Communications Officer.